Michael Whittingham who was one of the key players in Rovers' 1999 away win against Gateshead Fell. Hartlepool Rovers were on a 1990s revenge mission when they travelled to Gateshead for a crucial North East Division Two clash. They had been beaten at the Friarage by the same Gateshead Fell team earlier in the season when they seemed to be coasting to victory. But this time, there would be no doubt about the result as Rovers stormed to a comprehensive victory. And it was Rovers who were on the attack from the start when Wiles, Lithgo and Fitzgerald all combined for a storming run which only ended when Lithgo’s pass just failed to reach Fitzgerald’s hand within inches of the line. The visitors were back on the front foot again when Carroll’s superb take at the lineout 20 metres out, meant Allan Calvert could burst through to touch down. The fly half also stepped up to successfully add the conversion. Rovers were on a revenge mission having been beaten by Fell by a couple of late scores when seemingly coasting to victory in Hartlepool. Back came Fell when they reached Rovers 22 and were awarded a penalty with David Ferguson slotted over. The early exchanges were close but Rovers extended their lead when a kick by Whittingham into the corner was followed by good forward play and by Paul Kirton crossing over for an unconverted try. Rovers were in command and soon went over again when a great break by Whittingham led to Simon Rutherford going over and Calvert adding the extra points. Whittingham added another for Rovers, and the visitors dominance was emphasised when he and Calvert exchanged passes before Whittingham went over with Calvert converting. It was a commanding 26-3 to Rovers at half time. And it got even better after the break. Rovers pressed from the start and a Saunders chip through saw Kirton pick up and cross for an unconverted try. Fell tried to come back but Rovers broke out through Drummond and Rutherford. Saunders joined in and set the ball back for Potts who brought in the backs, before Kirton picked up for another. Kirton completed his hattrick when Rovers won a great scrum on the Fell 22. Whittingham found Calvert and his pass to Kirton meant the right wing could run in for another unconverted try. 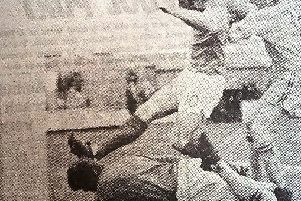 Fell tried to come back but Rovers defence held tight, and it was the visitors who ended the match in control with Champion feeding Potts who went over the line, only for him to be held up. The end of the match brought a final score of 41-3 to Rovers.